A old comission for a TCG. He leaves our planet Earth, tired of war, humans and other dragons. This was one of the first dragon pic I've ever seen here on DA! Love it! i regret to inform you this has been reposted without credit. 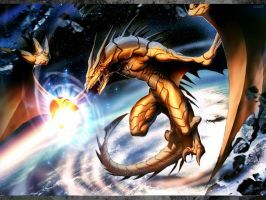 Todas las criaturas miticas, desde fenix hasta dragones me encantan, este dragon no sera la escepcion, gran imagen, me encanta!!!! This is awesome it looks like the ancient dragon you did for yugioh. This is amazing! WOW! Incredible! lol awesome dragon and bonus points for ya if you know where that quote is from! Es una reedición del dragon dorado de espada sagrada de myl? I have a name for this guy. Zarenius, Golden Legend. You like? Okay, well I'll keep my suggested name, and give a more Armageddon-ish name... Zezhrus God of the End, better than the last one? golden dragon used hyperbeam! it was super effective! The same James Cox is claiming this art to be his too. There's actually a story associating the Golden Dragon with the Holy Grail. The Golden Dragon, though not associated with the three Greater (Dragon) Elements of Fire, Earth and Water, is a master in using all three. He is the most beautiful of the dragons, pure, and free from all evil thought. Only one human is his friend, and only three knights had the honor of seeing him. The Golden Dragon is the guardian of the Holy Grail, and the three knights were those who sought it. Only one proved worthy, and before the shocked eyes of his comrades, the knight vanished from the face of the world, but not before promising that, should the humans prove themselves worthy of the Grail, they will return, and all Dragons shall gather to welcome them, the purest of humans riding on their backs. The wounds of nature will heal, hatred, war and pain will vanish, Dragons and Humans will live in peace with each other and the Golden Age of Peace shall reign eternally. If you don't mind me asking, where might I find this story? I have had recurring dreams of a golden Dragon, and so this sounds quite interesting to me. Sorry, it's been about seven years since I've seen it, though I roughly remember what it said. I am reminded of the game golden sun when I see this. I actually never heard of a myth about golden dragon's, not outside fantasy media anyway. He seems more like a celestial or cosmic dragon to me, ascending to the stars instead of to the heavens or some such thing. If you ask me, this is what a proto-dragon is, the first and arguably the most powerful of the species. I can't help but wonder, is it attacking something or is that just the sun coming over the planet? Either way this is great. Amazing! I feel like this should get a DD!